The Māmaki plant is a shrub/tree native to the Hawaiian Islands, growing at elevations up to 6,000 feet. 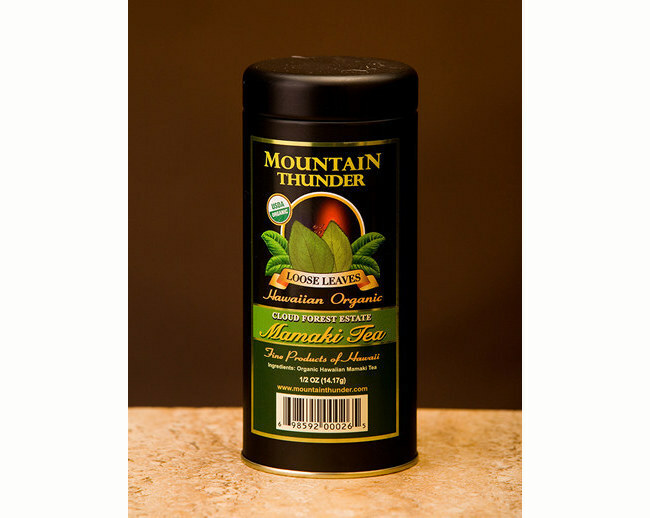 At Mountain Thunder, our Māmaki is grown and hand-picked on a USDA Certified organic farm here on the Big Island. The leaves are carefully dried over a wood stove to achieve the best flavor and health benefits. Native Hawaiians brewed Māmaki as an herbal tea and believed it to be a general tonic with many medicinal benefits. It was consumed to improve overall physical and mental well-being, particularly for any digestive issues. We now understand that Māmaki is rich in anti-oxidants and is believed to benefit high blood pressure. Because it is naturally caffeine free, it is often consumed in the evening just before bedtime. Brewing hint: Some customers are brewing a second or even third batch of their Māmaki Tea using the same tea leaves over and over, just steeping then longer … give it a try and save some money! Preparation Instructions: Māmaki can be enjoyed hot or cold. We recommend adding one tablespoon of crushed dried leaves to 3 cups of boiling water. Let the leaves steep for 15 minutes (or longer depending on your preference). The longer the leaves are boiled and the longer they are steeped, the more essential oils and flavors are released. Experiment a bit to find your ideal brewing method. Your loose-leaf Māmaki tea is packaged in a sealed plastic bag placed inside a reusable cylindrical tin. Contents ½ oz.